Rules Twist – Make Your Own House Rules! You have had some board games for a long time and you have played them over and over again. You still love those games, however they don’t give you the same thrill anymore. You would like to try something else just for a change and find out what it would be like if you could add some new rules or avoid following some others and see how things could work out. Well, this is your chance with Rules Twist! Rules Twist is here for those gamers who want new playing experiences for classic games by allowing them to easily add hilarious house rules to any tabletop board or card game they like. This is why there are two Rules Twist editions, one for board games and one for card games. Just select your favorite game, add your house rules and prepare yourselves for a hilarious gaming experience! The Board Game Add-On Edition is designed to easily add new house rules to your favorite classic board games with four Twist dice and 30 Hilarious Twist Cards. The Card Game Edition includes a deck of standard playing cards and a deck of Rules Twist action cards. They all have the same back, so your opponents will never know what’s coming! 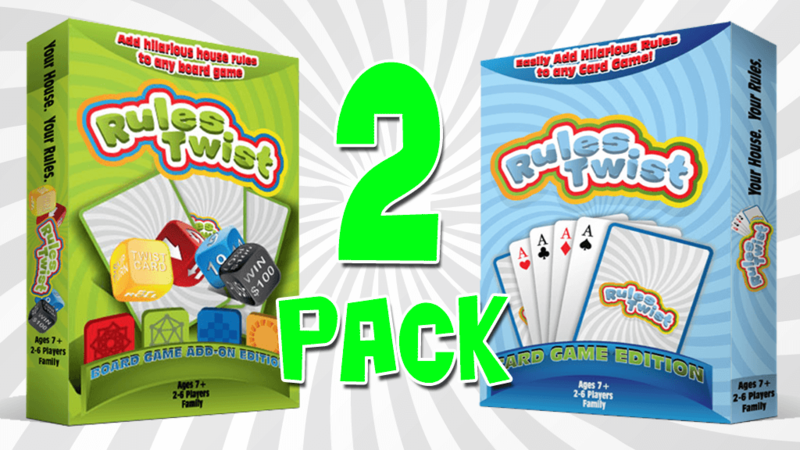 What is more, both of the editions feature 10 Blank Twist Cards, so that you may add your own rules! Rules Twist has been up on Kickstarter and will be running until November 19th, while it is due for release right in time for the holiday season!